Miami Dolphins fans were already calling for wideout Legedu Naanee to go after a horrible preseason and three catch-less games to start the regular season. When his first catch of the season late in the team's Week 4 contest against Arizona resulted in an inexcusable and provoked fumble, that was indeed the last straw. In what is sure to be general manager Jeff Ireland's most popular move in weeks, the team officially parted ways with Naanee on Tuesday while bringing in veteran wideout Jabar Gaffney to replace him on what is almost certainly a one-year deal. Gaffney initially worked out for the Dolphins on Sept. 3 after being released by the New England Patriots during the preseason. He also worked out for the Oakland Raiders about a month ago, though he remained unsigned until now as he recovered from a lingering hamstring injury. The Dolphins cleared two additional roster spots on Tuesday, terminating the contract of defensive tackle Andre Fluellen and waiving linebacker Mike Rivera with the injured designation for the second time in his career. Rivera will revert to injured reserve if he clears waivers, which is exactly what happened when the Dolphins waived him injured in August 2011. Fluellen appeared in two games for the Dolphins after signing on Sept. 18, playing 14 defensive snap and recording zero tackles. Rivera, who was added on Sept. 25, dressed for Sunday's loss to the Cardinals but did not show up on the stat sheet. The Dolphins will enter Wednesday with 51 players on their active 53-man roster, meaning a couple additions are certainly forthcoming. A San Antonio native who played high school football in Jacksonville, Gaffney redshirted as a true freshman at Florida in 1999. He made an immediate impact once on the field for the Gators, earning first-team All-SEC honors and first-team All-American honors in both 2000 and 2001. Gaffney left Florida after his redshirt sophomore season, entering the 2002 NFL Draft where he was selected in the second round by the Houston Texans. His four-year stint with the Texans was marred by inconsistency, as he appeared in all 64 possible games but failed to top 632 receiving yards or two touchdowns in any season. After signing with the Philadelphia Eagles as a free agent in 2006, Gaffney was released before the start of the season. 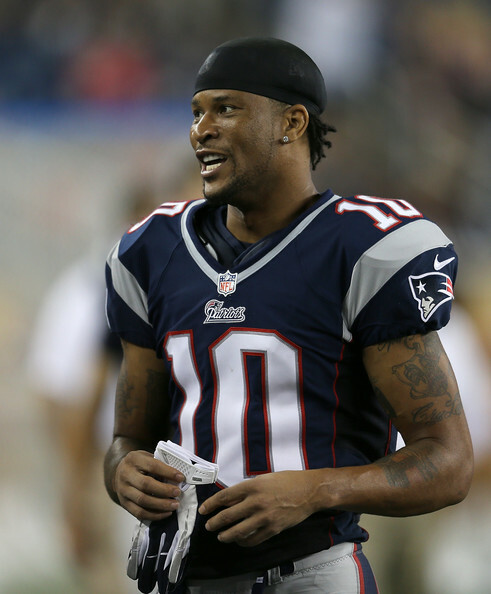 He joined the Patriots in what would end up being a three-year stint, working as a rotational receiver and topping out with five touchdowns in 2007. Gaffney headed to Denver in 2009, spending two seasons with the Broncos and setting career highs in receiving yards both seasons with 732 yards in 2009 and 875 yards in 2010. He played for the Washington Redskins in 2011, setting or tying personal bests across the board with 15 starts, 68 receptions, 947 yards and five touchdowns. After a brief return to New England prior to the 2012 season, Gaffney was released on Aug. 27. In all honesty, I'm more excited about the release of Naanee than I am the signing of Gaffney. Naanee was such a disappointment from Day 1, working with the starters for all of camp only to drop everything thrown his way in the preseason to barely getting on the field once the real games began. And of course, the fumble against Arizona was inexcusable and it was certainly time for him to go. Gaffney isn't a No. 1 receiver that's going to revolutionize the Dolphins' passing game and I honestly can't imagine him ever gaining a bigger role than Brian Hartline or Davone Bess. He's a solid piece to the puzzle and has a chance to unseat the unproductive Anthony Armstrong as the team's third receiver, but there's no guarantee Gaffney makes a real impact or even lasts the whole season with the team. In a best-case scenario, Gaffney would be able to at least earn that No. 3 job and catch 3-5 passes per game as another reliable target for the Dolphins' rookie quarterback in Ryan Tannehill. You certainly can't get any less productive than Naanee was and Gaffney's track record is much better, so there's nothing to dislike about the move. The departures of Fluellen and Rivera don't come as surprises either, as neither guy was a lock to stick around long-term. Fluellen's release either means Tony McDaniel (knee) is ready to return or the team saw enough of Fluellen and wanted to bring in a different player to look at there.